MAKE Interactive, Bitrix Gold Partner, Netherlands. 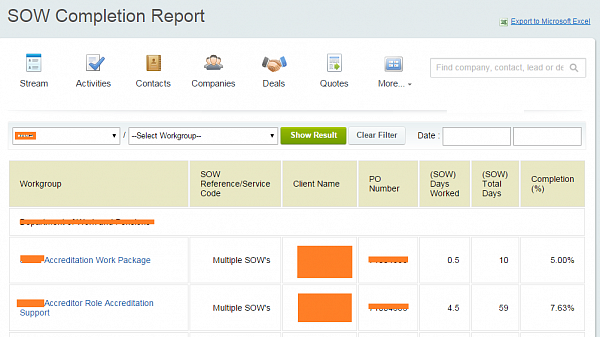 Large number of custom CRM reports. The task at hand was to integrate the CRM and project groups such that tasks could be easily assigned, tracked, and billed while maintaining smooth organization and assignment of tasks. This sounds perfectly easy given Bitrix24’s standard equipment, except that the scope of work performed for each client in this case is dizzyingly large and the number of tasks can reach into the hundreds. Thus, the work for each client is distributed among several workgroups, bespoke interface components for scheduling and time reporting are provided, hard limits on budgeting are implemented, and a couple dozen highly customized reports were created. In the end, all of the activity related to a single client needs to be gathered up in one place and reported on. That one place is customized CRM reports which themselves are granular at the workgroup level. The customized interface features (timesheets, reporting in the CRM, and the scheduling tool) allow dynamic selection of Client > Workgroup > Task via pull-down lists. The process inside the intranet starts with a Deal in the CRM – which represents a signed contract. Up to 50 workgroups could be created where the various types of services included in the scope of work for the given client. For example, hardware installation would be in one workgroup, and data security consulting would be in another, with little overlap of group members other than the account manager. Some input short-cuts were created to facilitate the entry of tasks and billable time into these various workgroups. The below timesheet lets a user input time spent on a client. The dropdown lists are dynamic – when a client is selected, the workgroups associated with that client (to which the given user has access) are pulled into the Workgroup dropdown for selection. Likewise with the Tasks after the Workgroup is selected. 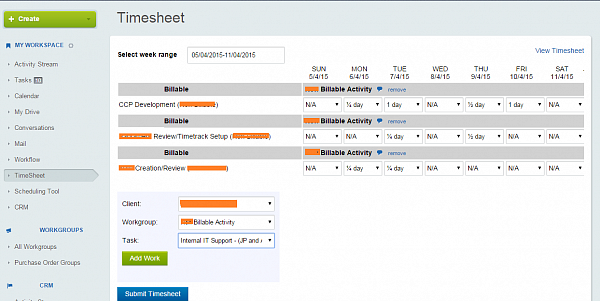 When Client, Workgroup, and Task are selected, the employee can put in billable time. If the user attempts to put in more time than the given task is allotted, a warning will appear and the entry will not be accepted. Time increments were set for ¼, ½, ¾, or 1 day. The timesheet is submitted, and can be viewed afterward by the user and edited. Here the calendar, where the week can be selected, hides the Workgroup column. For supervisors, a convenient and simple scheduling tool is available, so that employees’ activity is optimized. This tool sits in the My Workspace section of the menu. The project is entered in the cell of an employee, and when that employee enters time into a project task for that time-slot, the flag goes from white to black. As you can see, the tool pulls information from the Absence Chart (red) as well. None of this is valuable, however, without clean and clear reports to serve as the basis for billing clients and paying employees. The list of customized reports created is extensive, but what is important is that the reports can be generated by choosing the client (top right box) and then one of the workgroups associated with the client. Alternatively, all of the workgroup results can be shown together. A date filter is also provided. This customization demonstrates the usage of Bitrix24 that allows a large number of consultants to work on hundreds of tasks with transparency at both low and high levels, with the main outputs being concise and specific reports to monitor performance, payroll, and billing.